Last week I had the chance to get a tour of Netflix’s new headquarters in Amsterdam. They just moved into a stunning space in one of the best locations in town. The office is airy, subtly and elegantly styled with unobtrusive rationalist design. Light pours in from everywhere and the space feels both personal and functional. Every corner offers a comfortable environment conducive to productivity. Observing this great example of interior design got me thinking: how does my home office stack up against the best office space from one of today’s most respected companies? And is one better than the other? I’ll start with what my home setup has in common with the newest international corporate offices. Netflix uses motorized standing desks almost everywhere. You can adjust their height and work with or without a chair. While sitting is not banned, and you can find plenty of “normal” desks, the variable height desk seems to be the new standard. It’s a standard in my home office too, for almost 4 years now. Okay, how did we get to food so fast? Having the comfort of a fully stocked kitchen is one of the core necessities of any workplace. Netflix has kitchens literally at every corner. I spend a bunch of time in my kitchen, and for good reason. I love to take a break and cook a tasty lunch, prepare a snack or just have a space to decompress and sip a tea. You can find screens on almost every desk in a modern office, but each workstation needs a laptop to come to life. The modern workplace is defined by the combination of a small notebook (typically from Apple) and fast cloud services. This is now the standard almost everywhere. And it should be. The laptop allows you to be productive wherever you wish. I haven’t had a “fixed” computer since 2010 and I’ve never missed it. The whiteboard is one of the key productivity tools for creative professionals. Anyone who hasn’t tried it, should order one right now. Netflix has whiteboards all around the office, especially inside the many well-equipped meeting rooms. They are used as collaboration devices for brainstorming, idea clarification, and sharing amongst team members. The whiteboard is also an essential part of my home office. I use it to stay focused on my most important or complicated projects, work out strategies and plan how to execute them. Essentially, the whiteboard helps me brainstorm with myself. It takes on a more personal nature than its corporate counterpart, which is similar to the next commonality I observed. Here I go again. First the kitchen, then the couch. Not what you generally think of as a productivity device, right? Well, most modern offices have couches, and Netflix has plenty. They serve the purpose of creating a smaller, comfortable space within the open plan, or a relaxed place to collaborate with colleagues. In my home office I have two couches, but as with my whiteboard, their nature is much more personal than collaborative. One is perfect for 35 minute powernaps. The other is where I meditate. Although both activities actually increase my productivity a great deal, I’m not sure how they’d work out in an open-plan shared office. So, let’s look at some other differences between a top-end silicon valley office and my DIY setup. Everyone needs fast internet in their office. But the speed you get when you connect to the internet at a silicon valley company is something else compared to what you get from home/home-office level contracts. The faster the internet, the higher the productivity of every person and every system. Sadly, the ISPs are not listening. A bustling office with cafeterias, kitchens, and an open-plan layout with back to back desks, certainly has a distinct soundscape. There are people talking to each other, people eating, people on phones, people on hangouts. Only when it’s empty can you expect it to be a quiet space. In my home office, when I’m not on a call, the music is playing. What music? My Focus@Work playlist (that is already being used by over 2,000 people). I use sound to concentrate – and for instance – help me write this very article. A personalized soundscape would require headphones in an open-space environment and create a rather different effect. From this quick analysis, it looks like the silicon valley office needs napping pods and my home office needs a meeting room with faster internet. But, in fact, I beg to differ. I don’t spend all of my work time in my home office. I travel around and visit many other offices around Europe each month. These are important spaces to me: there I meet colleagues and clients, there I share the space with friends and partners. These other offices are places where I do a vital part of my job: I collaborate. But I am also happy to go back to my home office in Berlin because that’s where I’ve adapted a space for me to be creative and effective. What is the best solution? Is my home setup better than a silicon valley office? That’s not the question. The corporate office and home office serve two different purposes. And you need both offices in your work life. We all need two offices. There is a reason why Google, Facebook, Netflix and just about every other innovative corporate culture uses open-plan offices: the open space clearly works. It enables teamwork and collaboration. It’s a great space to connect & discuss with your colleagues. It’s an environment that fosters the exchange of ideas. It’s a place where you’re invited both to listen and to participate. It’s also a place of action: you come together, debate, discuss and decide. The open plan office is where the hive forms, thrives and moves. However, we all need a quiet personal space to be productive. There’s plenty of science on how interruptions affect productivity (not in a good way!!!). A personal office is a space that fosters creativity and invention. It creates the conditions for strategizing and long-term thinking. It’s a comfortable space, free from external judgment, where you can be and express yourself. And I equate being yourself to the fullest with being as productive as you can be. The personal office is where the individual is empowered to strategize, produce and create. All professionals that work in the knowledge economy need both spaces. The hive mentality is crucially important as it fosters communication, exchange and quick iteration. But you can’t expect creative professionals to write, copywrite, develop strategies, or plan long term outside of the protected cocoon of a personal space. When I transition from my home office cocoon to the open space, at first I’m annoyed. I notice all the distractions. I wonder why some colleagues broadcast their conference calls on speaker-phone, why others decide that it’s important to interrupt 10 people to let them know about the new tool they have just found. But, after a few hours of working together, I understand the flow of the open space. It’s not about me and my individual productivity, it’s about the movement of the hive. The fact that we share the same light, the same air conditioned temperature and the same desk, means something more profound: we’re sharing a total experience, which includes our knowledge and limitations. Listening in on a call makes sense: in that call there could be the cue I am waiting for to develop a new product feature. I can see exactly what issues people are working on and even tell if they’re stuck and need help. Most open spaces are a bunch of people crammed into a room. That’s not how it’s meant to be: the open space should always be airy, beautifully designed and should allow you to follow your work group. It should even promote eating and resting together. When I get back to my home office I appreciate the amount of control I have over external factors: windows, shades, music, lights, smells can all be customized to my exact preferences. The decor is the one I chose to keep me focused and inspired. Even the direction that my desk is facing is functional to eliminate distractions. Knowing where everything is and how everything works puts me at peace with the environment and allows me to relax and dial back control. This in turn gets the creative juices flowing and makes invention possible. Not all personal spaces need to be in a home. These cocoon spaces could also live side by side with the open space, in a separated part of the office. But they need to be personal, individual and fully customizable. In the cocoon there are no compromises, it has to be a perfect space. Mr. Gorbachev, tear down this (open-plan) office! Facebook is proud to have the biggest open-plan office in the world, but do we need to tear it down? 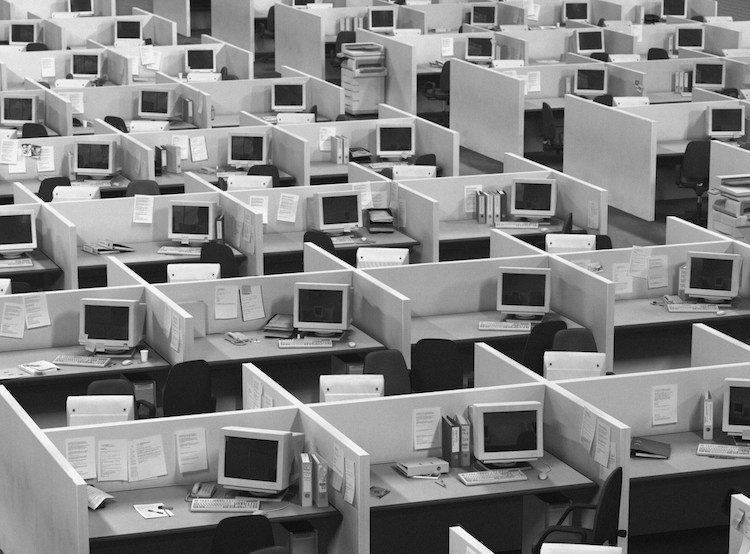 There are definitely signs of a rethink of the open-space office. We know that uninterrupted time is our most precious commodity. We know that programmers can’t work in an open space all the time. We know that implementing days where meeting are prohibited increases productivity. I would add that we need private spaces, with different soundscapes, illumination and decor to be our best professional selves. So do we need to call it quits on the open-space corporate office? Maybe, but as long as companies respect the time of their employees (not littering their agenda with meetings back-to-back) and allow them to work from home, I think that we’re going to be fine. The personal cocoon and the open plan can coexist peacefully. What I’m proposing here is that we split our work schedule between open-plan-office-collaborative-hours and creatively-cocooned-personal-space-hours. Distinct spaces with distinct objectives and to do lists. If you liked what you read here, please subscribe to my almost monthly newsletter where I tackle marketing, productivity, entertainment, innovation and office spaces. I love the creativity and flexibility of your stand up desk. I’m going to pass a screenshot onto somebody I shared office space with the 1980’s who had to have his custom made! Communal space vs. individual space has a long history. The old cubicle farms always reminded me of battery chickens, so the Netflix and more modern designs are a huge improvement. Lie you, I am a great believer in having single purpose rooms – meditation/quiet rooms were popular on the west coast of North America for a while, but seeing as I now work in the country, (sitting down) in my basement, I don’t see too many big offices anymore. Just as well, as the recirculated air always played havoc with my productivity. Maybe it’s time for a trip to IKEA to improve my circulation! I look forward to your newsletter every month. Are you racing in September? Hi Roger, thank you so much for your input. Fortunately the open plan office has supplanted the cubicles. They represented the worse of both individual and communal spaces. I want to further explore the topic as I think we don’t often give enough consideration to how light, air, smells, materials are also a crucial part of our daily productivity. Plus I’m considering getting into more details on how functional office furniture should look like. Let me know if this sounds like an interesting direction to you. Thank you so much for your feedback and speak soon!